A SLAP tear is an injury to the cartilage in the shoulder. It is often seen in overhead throwing athletes, especially in pitchers. SLAP lesions can be classified into 4 different primary categories, and treatment can range from conservative rehabilitation to surgical intervention. A SLAP tear is a specific type of labral tear in the shoulder. It is named for its position, being at the top of the glenoid (superior) and running fromt the front (anterior) to the back (posterior). 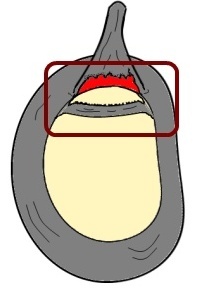 SLAP lesions are classiified by the extent of the injury, and also on the involvement of the bicepts tendon. The biceps tendon attaches into the upper portion of the glenoid labrum, and a tear in this area can compromise the stability of the tendon. This attachement can also play a role in causing a SLAP tear, due to its pull on the shoulder during overhead activities. One of the most common causes of SLAP type tears is repetitive overhead throwing. Overhead athletes, especially baseball pitchers, place huge amounts of stress on the shoulder with every throw. The position of external rotation can overstress the attachment of the biceps tendon and can lead to tears in the labrum. Proper mechanics and a good shoulder stabilization exercise program can help to reduce the risk of shoulder injury. A type I SLAP lesion is a degeneration or fraying of the superior portion of the labrum. It does not usually involve actual detachment of the labrum from the glenoid, and may be treated successfully with rehabilitation. Type I tears may require surgery for a full recovery, but all that is needed is a simple debridement, with no need for repair. 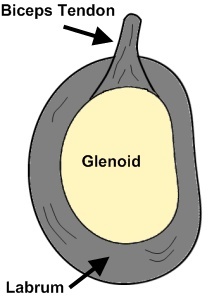 Type II tears involve a detachment of the upper portion of the labrum from the glenoid. It may also include some degeneration and fraying of the labrum as well. This type of tear does not extend into the biceps tendon. Type II tears generally require surical repair followed by rehabilitation for a full recovery. Surgical repair is usually accomplished by placing an anchor in the glenoid and then suturing the labrum back to the bone. The size of the tear will determine how many anchors are needed. A type III SLAP tear involves detachment of the labrum from the glenoid, as well as a bucket handle tear of the labrum. This results in an unstable biceps tendon attachment. Type III tears require surgical intervention for successful recovery. Repair of the bucket handle tear and reattachment of the labrum to the glenoid is necessary. 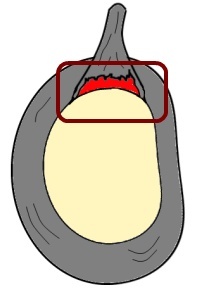 Type IV tears involve detachment of the labrum from the glenoid, a bucket handle tear of the labrum, and extension of the tear into the biceps tendon. This type of tear results in an unstable biceps tendon, as well a significant instability of the labrum. Surgical intervention is required. Type IV tears often require repair of the labrum, and depending on the extent of the damage to the biceps tendon, a biceps tenodesis procedure to restore the stability of the biceps tendon attachment. Much like other types of labral tears, SLAP tears are often accompanied by pain, weakness, popping or clicking in the shoulder, and decreased range of motion and strenth. Overhead positions, especially with external rotation may be painful. You may also have feelings of instability - your shoulder may feel like it is going to pop out of place. Rest may help to reduce pain, but unfortunately most SLAP tears do not heal on their own and may require rehabilitation or surgery for successful treatment. SLAP tears are common shoulder injuries, especially for overhead throwing athletes. They can be classified into four different categories, depending on the severity of the tear. Surgical intervention may be required for a full and successful recovery. If you have shoulder pain or think you may have a labral tear, see your athletic trainer or family physician for an evaluation.